A good Samaritan has spoken of his anger after being snapped and fined by a mobile camera vehicle while helping a blind elderly woman find her daughter. Private hire driver Dave Barry, of Mentmore Crescent, Dunstable, is a friendly face to the town’s senior citizens, who he drives to the GP’s surgery and back again. 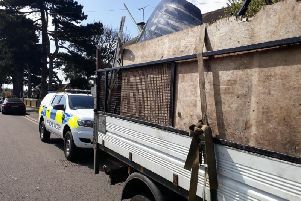 But it was while transporting a blind elderly woman, who has mobility problems, to the surgery in West Street, that Dave was caught out by a mobile camera vehicle and issued with a parking penalty notice. The fine happened on March 21 shortly after Dave had dropped the woman off at the doctors. She had arranged to meet her daughter outside the clinic and asked Dave if he could spot her. Dave said: “What happened was I was looking for her daughter. I reversed the car by about three feet just to see if she was coming down the street, and for a second hit a zigzag line. Within three weeks, Dave was issued with a parking penalty notice. He said: “I feel so incensed because I’ve been taking dozens of elderly ladies to the doctors. The oldest one I take is 96 and they’re glad for a friendly face to take them there. “It’s got nothing to do with the money. It’s the fact that common sense doesn’t even apply. They seem completely oblivious to the fact of whether you’ve got a Blue Badge on there or not. A Central Bedfordshire Council spokesman said: “We understand that Mr Barry was assisting a disabled lady, but the law states that you are not allowed to stop or park on a zigzag line on a pedestrian crossing as it is a significant safety risk.